Earthbending, one of the four elemental bending arts, is the geokinetic ability to manipulate earth and rock in all their various forms. It is utilized by people of the Earth Kingdom and the Imperial City. Earth is the element of substance, making earthbenders and their people diverse, strong, persistent, and enduring. The first earthbenders, Oma and Shu, learned the art from badgermoles. The key to earthbending is utilizing neutral jing, which involves waiting and listening for the right moment to strike and, when that moment comes, acting decisively. In other words, earthbenders generally endure their enemies' attacks until the right opportunity to counterattack reveals itself. During the era of Raava, the power of earthbending was temporarily bestowed on the inhabitants who lived on a giant lion turtle while they left the village to hunt for food. After the inhabitants permanently left the care of the lion turtle, humans first learned to reconnect and refine their earthbending by observing and imitating the geokinetic abilities of badgermoles that naturally inhabit the mountains in what is now known as Earth Kingdom territory. According to a legend, known widely as "The Legend of the Two Lovers", two star-crossed lovers named Oma and Shu, who hailed from separate warring villages, were the first people who learned the art from these creatures so that they could meet within the mountain that divided them. To make sure no one could ever find them, they used their new abilities to create a labyrinth of tunnels inside the mountain, which only they could navigate. One day, after many meetings in the series of passageways, the man did not come to see his lover, as he had died, a casualty of the villages' quarrel. His lover showcased a devastating display of her earthbending abilities and ultimately proclaimed the feud over. The villages subsequently collaborated to construct a city, Omashu, in their honor. The pathways they made by earthbending became known as the Cave of Two Lovers. Earthbending is one of the most diverse of the bending arts, ranging from the most commonly used earthbending-the rigid and collectively learned earthbending of the Dai Li and the individually taught styles. Earthbenders are generally muscular, tough and direct, and like all benders their technique reflects on their individual personalities. With the advent of pro-bending, earthbenders have learned to adapt fighting styles that are more suited to a fast-paced pro-bending match. Most earthbenders participating in pro-bending have learned to keep mobile and only root themselves long enough to actually launch and direct the earth discs provided in the arena. Earthbending differs from the other bending arts in that it maintains a distinct balance between offensive and defensive capabilities (though waterbending involves a more refined version by channeling defense into offense). Earthbending uses a balance of strength and defense to overwhelm opponents. The principle of jing is the essence of battle strategy of all bending arts, with a total of eighty-five possible actions. Positive jing occurs when one chooses to fight, while negative jing is when one chooses to evade. The earthbending discipline stresses neutral jing, which involves listening, waiting and attacking at the right moment. Earth and stone levitation: The most common attack involves levitating nearby pieces of earth and stone of numerous sizes (more powerful benders can move larger masses) and propelling them at foes with punching or kicking motions. Earth block: Earthbenders can bring up blocks of earth and launch them at their enemies. Earth column: A more powerful version of rock projectiles, involving forcing columns of rock out of the ground. Using a similar principle, an earthbender can shoot a stream of small ruts and protrusions from underground at their opponent. This can also be used to enhance the benders' jumps. It is, however, limited to the ground and does not have the same range as a rock projectile. Earth compression: It is possible for earthbenders to compress large chunks of rock into smaller, denser chunks, or to compress several smaller chunks into one big piece of rock. It is far more effective with two earthbenders. Earth hand/mannequin: An earthbender with a decent grasp of sculpting can craft replicas of human appendages or bodies from any rock source and move them from place to place. Earth gauntlet: A much less advanced version of earth armor that can be used to throw back opponents with hard solid force. The technique is useful in that it grants some level of the protection of earth armor but allows the rest of the body to remain flexible. Earth launch: While earthbenders like being rooted to the ground, they can quickly move rock beneath them and launch them several tens of feet into the air, whether to catch airborne opponents or to travel faster. Earth line: As an offensive attack, earthbenders can create a line of twisted columns and propel it forward. Earth material manipulation: Earthbending is not limited to rock or soil alone. An earthbender can also manipulate coal, gems, crystals, and other earth-based materials, like meteorites . Earth shelter: This can be used by earthbenders to create a shelter or dome which can provide an instant shelter in the wilderness. It can also be used to trap enemies, but this application would not work against an earthbending opponent, who would be able to cancel out the technique. Earth sinking: More advanced earthbenders can forcibly sink their opponents into the ground, imprisoning them or even suffocating them in earth. Earth smash: Earthbenders can easily destroy rocks and boulders with punches and kicks, even if they have a very small amount of muscle mass. 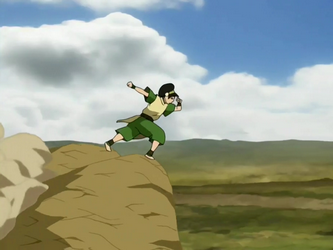 This technique is useful when facing other earthbenders, as it allows the earthbender to destroy any earthen projectiles sent at them and break out of imprisoning techniques. However, it does not seem to affect objects not made of earth. Earth wall: Earthbenders can create walls of earth, which can be used for both defense and offense, as well as for practical things, like construction. Earthquakes/fissures: Striking the ground with feet, fists, or hammers, as shown by Gow, creates localized earthquakes or fissures to throw opponents off-balance. This same process can be used to sculpt a landmass or to slice large chunks of rock clean off a surface to create avalanches or rockfalls. More advanced earthbenders can make very narrow fissures for precise attacks. Quicksand: Earthbenders turn certain surfaces to quicksand to immobilize an enemy, or to create a soft landing for themselves should they fall from a height. Sandbenders can also do the reverse of this, compacting sand together to create harder projectiles or a firmer grip on the ground. Rock hanging: If an earthbender is attached to, or wearing a piece of rock, he or she can attach to other stone surfaces and remain off the ground for long periods of time. The Dai Li are the only ones that have demonstrated this ability through the use of their earth gloves, giving them the ability to cling onto a rocky surface. Rock shield: A levitated slab of rock can also double as a shield when positioned in front of a bender. This can also be performed with a slab or sheet of bedrock thrust out of the earth's surface. The shield can be hurled at the opponent for quick retaliation. Rock slide: If an earthbender is near a cliff or mountain, he or she can cause many rocks of a multitude of sizes to rain down on his or her opponent. Slab shackles: With proper timing, an earthbender can bind an opponent's arms with triangle shaped slabs. This technique is generally used if the opponent is in a vulnerable position, for example on their knees. Dust cloud: By shaking the ground back and forth, earthbenders can create dust clouds of various size to provide cover, and even manipulate the dust particles. Earth armor: Earthbenders can bring rocks, dust, pebbles, or crystals around them and mold them to fit their body and create something similar to armor. They can also hide inside the earth by bending the rock around them as a shell. This earthbending move is great for defense, especially against fire. It is not as effective for offensive moves, since it limits the practitioner's range of motion. Earth bomb: By sending a rock toward the ground, earthbenders can cause massive damage as well as throw their opponents off their feet. Earth tunneling: Earthbenders can move through the earth to out-maneuver their foes either by opening tunnels or by pulling the earth past them, literally swimming through the ground. Earth wave.Earth wave: High level earthbenders can create a wave of earth to ride on and use it as a form of transportation. The downsides of the wave are that it takes a lot of energy to produce, as well as intense concentration; the slightest distraction could cause the user to lose control of the wave. They can also force a wave of earth outwards and use it as an extremely powerful offensive attack. Magnetization: Skilled earthbenders are capable of magnetizing their limbs to any type of stone, making wall-scaling simpler in the appropriate circumstances. The Dai Li agents can perform this move with ease, and even stay upside down. Remote earthbending: If an earthbender is suspended from the ground, but is aware that there is earth somewhere near, the earthbender can focus his energies and bend that earth out of his physical reach out of sheer concentration. Compressed rock bullets: Shrapnel-like fragments of earth can be shot out with great speed, in a machine gun-like fashion. Due to the speed and density of these rocks, they did great damage to the landscape. Greater earth levitation: With their greater power and stronger connection to the earth, the Avatar can move hill-sized statues at will. Powered compression: This is a much more powerful version of the earth compression technique. Instead of bending large chunks of earth into a single projectile, they are gathered into boulder-sized rocks and simultaneously compressed each fragment into smaller, denser and harder rocks, essentially keeping the rocks under pressure for more volatile attacks if needed. Lastly, the rocks are directed to orbit until they are put to use. Tectonics: The Avatar can earthbend on a scale vast enough to move entire landmasses. Water filtering: When working in concert with a waterbender, an earthbender can purify polluted water. The waterbender suspends the polluted water in the air, while the earthbender removes the pollutants and sets them aside. Compacting sand: Sandbenders or earthbenders can perform this technique. Compacted sand is very solid and thick, and by sinking their feet into it, earthbenders and sandbenders alike can keep an object from sinking. Mudbending: It has been seen that earthbenders can bend earth in mud as well. Rock gloves: The Dai Li have mastered the rock glove technique. Similar to an earth gauntlet, they cover their hands in small rocks and project them at a target as small projectiles or compacted fists to bludgeon an opponent. A more refined and favored method however is to use them as detachable hands, maintaining the hand shape and literally grabbing and restraining the opponent from a distance. Rock shoes: The Dai Li also used shoes made out of earth to slide to travel faster and to cling to walls and suspend themselves on the ceiling. It is expected that they could also be used like rock gloves to extend the range of kicks. Seismic sense: A technique originally developed by the blind badgermoles, skilled earthbenders are able to sense vibrations through the ground, "seeing" by sensing their surroundings and making a mental image of it. It allows for a 360 degree field of "vision", outside of normal line-of-sight. To operate, the user needs direct contact with the ground, preferably without something like shoes in between. The technique is not applicable on all surfaces, such as ice. Extensive use of the technique would grant an earthbender a seismic sense was so acute that they would be capable of sensing even ants moving about, could identify people by the way they walked, and could almost always tell if someone was lying by sensing his or her physical reactions, such as breathing and heart rate. Sandbenders are earthbenders who have adapted to life in the Si Wong Desert. They use earthbending in a specialized style, which emphasizes the manipulation of sand. They move quickly in the desert on specialized wooden sailers that are propelled by bending miniature, localized sandstorms behind their sails. Because sand is sediment which travels in flows, their style resembles air and waterbending more than earthbending. It is implied that most, if not all, earthbenders are capable of easily bending sand, but because of the loose shifty nature of sand it is not an easy transition for the average earthbender. The sandbenders of the desert are especially proficient with it due to their particular habitat. Earthbending is the opposing bending art to airbending. When first learning to earthbend, the pupil must first learn confrontational tactics and familiarity with the brute strength necessary to work with earth. This contrasts with the emphasis of airbenders on mobility and evasion. Earthbenders require a firm root in the ground, while airbenders are constantly moving. Like all of the bending arts, earthbending is balanced so as not to be more or less powerful than the other arts. It is the skill and prowess of the user that determines victory. Metal and wood: Because earthbenders cannot bend processed metals, the bending abilities of an earthbender can be negated by securing them within a metallic barrier, separating them from any contact with the earth. Wood cannot be subject to earthbending because it is neither a mineral nor mineral-like. Reliance on the lower body: Earthbending is at its strongest when the feet are in direct contact with the ground, enabling earthbenders to transfer their kinetic energies into their bending for fast and powerful moves. Because of earthbenders reliance on their feet, firebenders can take advantage of that by burning them, or disabling them somehow. This weakness is very similar to how disabling a waterbender's arms prevents them from bending. Since a skilled earthbender could overcome this weakness by bringing the other parts of their body into contact with the earth, as stated above, the danger level of this weakness could be debated. Earthbending expresses the aspect of neutral jing, which involves listening and waiting. Earthbending also requires decisiveness; when the time comes to strike, it must be done without hesitation or uncertainty. If an earthbender lacks determination, the earth will not respond to their will. Being connected to the earth is also a very important aspect of earthbenders' spirituality; earthbenders, mostly earthbending soldiers and generals, typically travel barefoot to increase their connection with the earth and their power. Avatar: Destiny Wiki is a FANDOM Lifestyle Community.